Computlink Sdn. Bhd. was establish on Jun 1997 as a representative IT Sales and services organisation. The Management team, which has in-depth technical, operational and commercial strength to ensure the quality and professional support is available to our customers. Computlink Sdn. Bhd. has subsequently evolved into service organisation that offers not only an extensive portfolio of representative product but also the comprehensive range of services. 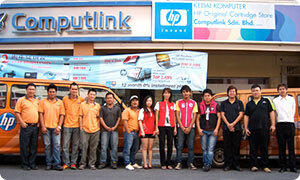 Computlink Sdn. Bhd. is committed to assist the industry by providing Cost effective IT solution to meet the requirement. We aim to provide a unique service which, we believe will make measurable and satisfactory contributions to our customer’s business. Our products and services all conform to the highest quality standards available to the industry.